The Battle of Shiloh is considered by American historians as one of the bloodiest wartime fights of the modern era. General Ulysses S. Grant led his troops to Union victory and, as biographer Jean Edward Smith accounts in his highly respected, well researched 2001 book titled "Grant," showed a leadership trait that should be emulated by anyone who strives to win a "battle." "A general imparts attitude to an army. It is not simply a matter of issuing orders, but infusing spirit and initiative. An inchoate bond develops between a successful commander and the army. His will becomes theirs...The men fought because they knew that Grant expected them to, and they trusted his judgment that they could do so." 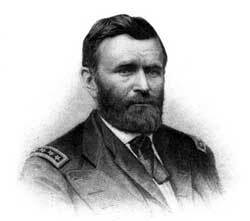 The key to the relationship Grant forged with his troops was the success he showed in battle. The general is known to have lost as many battles as he won, but the "wins" he scored in the fighting were significant and game-changing. Grant's soldiers followed him through thick and thin. I recognize, as an educational leader, that I will have to show successes before I can expect my "troops" to follow my vision. I realize the leaders, teachers, and parents in my schools will not support my work whole-heartedly unless I can prove that their adherence to my plans for student achievement will pay off in the end.